The neighborhood can also expect additional preparation activities throughout the project area including inspecting and cleaning sewer pipe, surveying, trimming trees, marking and relocating utilities, manhole maintenance, and crews bringing equipment and supplies to the project area. To view photos and learn more about these activities go to http://www.portlandoregon.gov/bes/precon. Sewer and stormwater construction is expected to begin in March 2018, and take about a year to complete. 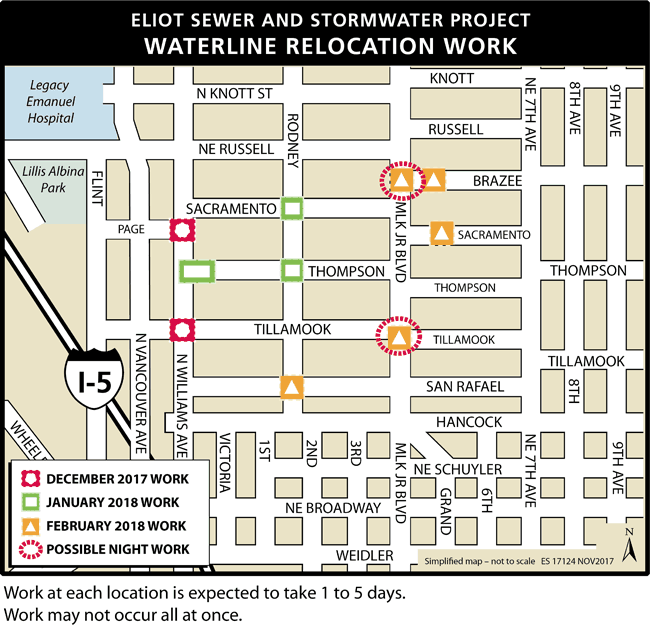 City of Portland Environmental Services will be replacing or repairing approximately 10,000 feet of public sewer pipes in the southern part of the Eliot Neighborhood. These pipes are deteriorating due to age or are undersized for the sewer and stormwater flows in this area. The oldest pipe being replaced is 115 years old. These improvements will help protect public health, property and our environment by reducing the possibility of sewage releases into streets, homes and businesses. The project also includes constructing green street planters in the right-of-way on public streets in key locations. These green street planters will divert 1.9 million gallons of stormwater annually from the sewer system, which helps prevent overflows into the river during periods of heavy rains. For more information or to sign up for the project’s email update list, visit http://www.portlandoregon.gov/bes/Eliot or email Matt Gough at Matthew.Gough@portlandoregon.gov with “Eliot” in the subject line.